Ezin is Commissioner for Education, Science and Culture of the Economic Community of West African States (ECOWAS), and prof., Inst. of Maths. and Phys. Scs. (IMSP), U. of Abomey-Calavi, Benin. He was Commissioner for Human Resources, Sciences and Technology, African Union Commission. He obtained his Doctorat de 3e Cycle (1972) and Doctorat d’Etat (1981) at the Université des Sciences et Technologie, Lille Flandres, France. He served in various capacities in the public administration of Benin: Rector, Natl. U. of Benin; Advisor, Min. 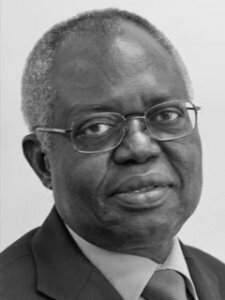 in Charge of Economy and Employment; founder and first dir., IMSP; and initiator of several African mathematical networks, as well as of the African Mathematical Union. He was honoured with: Palmes académiques françaises; Organisation Internationale des Palmes académiques (OIPA–CAMES); and Ordre National de Mérite du Benin. Keywords	 Hyperbolic partial differential equations; differential geometry; Riemannian and pseudo Riemannian geometry.